DriftRunners, by developer LongAnimals, is an arcade rally-racing game that – to be blunt – is freaking awesome. If you’ve been a gamer long enough, it will probably invoke fond memories of the arcade-classic, Ivan “Ironman” Stewart’s Super Off-Road. The racing and “drifting” physics are fantastic, the controls are simple and sublime, and the AI provides a challenge without feeling unfair. 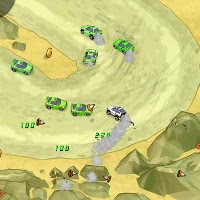 You’ll begin by selecting one of the two available vehicles (which seem to drive identically), and begin racing on the first of six tracks. Subsequent tracks are unlocked by placing first in the prior race; however, there’s a lot more to DriftRunners than simply being the first across the finish line. Each track is littered with obstacles like cones and barricades; however, bananas, snowmen, and other strangeness are also present (depending on the track). The cool part is that you’ll actually be awarded points for crashing into this stuff. Scattered coins collected on a track can be used between races to upgrade acceleration, steering, top speed, and lightness. Besides winning, each track gives you five bonus objectives to complete. These goals vary from track to track, and include tasks like hitting a certain number of objects, jumping a certain distance, or staying on the track for the entire race. DriftRunners is quite possibly the best free Flash arcade-racing game available right now. It’s fast, fun, and delivers unmatched racing action. I can’t recommend it highly enough. One can only hope that LongAnimals has a multiplayer version on the drawing board.